The return by the secular Iraqiyya coalition to parliament, announced yesterday, seems like a logical albeit long overdue move. In the first place, to boycott parliament was in itself a tactic that above all signalled isolation: Iraqiyya was unhappy with the general direction of Iraqi politics but was evidently unable to change the political game, whether through its representatives in parliament or through its participation in cabinet. More recently, there has been evidence that Iraqiyya was also hurting itself through its actions. Since the start of the boycott, the frequency of defections from the coalition in both Sunni and Shiite areas has increased. Still, it is noteworthy that Wataniyyun, one of the recent breakaway groups who promised to never rejoin Iraqiyya, yesterday hailed the decision of the leadership to return to parliament. The lingering question is whether Iraqiyya will withdraw its ministers permanently from cabinet. In that respect, there have been even clearer indications of a substantial renegade trend headed by Iraqiyya ministers wanting to keep their cabinet jobs despite having been ordered to boycott by their party leaders. In particular, the ministers who have continued to attend meetings despite the official boycott are from the Karbuli bloc of Iraqiyya called Al-Hall as well as a Turkmen minister for the provinces. At the same time, there are signs that Maliki and State of Law also have shortcomings with respect to their ability to benefit from the situation. For example, their deputy Fuad al-Dawraki yesterday expressed satisfaction of the return of the Iraqiyya “since it represents a certain component” of the Iraqi people. That is not only tantamount to falsely claiming Iraqiyya is a Sunni party; it also indicates the limits to the prospect of the (mainly Shiite) State of Law successfully co-opting breakaway elements from Iraqiyya as much-needed additional parliamentary support. What will probably define the struggle in the weeks to come is not the elusive national conference or any real attempt at implementing the Arbil agreement, but instead the fight for the annual budget – the only item parliament is constitutionally bound to deal with, and also the only item where Maliki truly needs the active support of parliament. In recent sessions it seemed Maliki would have to navigate between Kurds seeking concessions for their emerging energy sector and Sadrists with populist demands about citizen petrodollars. With the return of Iraqiyya, there will be the third alternative of compensating Iraqiyya deputies in Sunni-majority areas with budgetary pork barrel. A potentially cross-cutting and complicating issue in all of this is the continued struggle over the general amnesty law. On this issue, Sadrists and Iraqiyya see eye to eye in wanting a more liberal regime, whereas Maliki’s State of Law coalition is more restrictive towards wide-ranging amnesties. In the past, there have been attempts by politicians to bundle several bills with the budget in order to maximise their own leverage in negotiations, though not always successful – the law on electoral conduct proposed in December 2009 being a case in point. Chances are Maliki will press for a separate budget deal with whomever is prepared to negotiate with him on his terms. Iraqiyya are trumpeting the initiatives from Sadrists and ISCI (as opposed to the stance of Maliki) as reasons for returning to parliament. If there is to be more than rhetoric to this, they will need to find agreement on issues (and agendas) when parliament reconvenes tomorrow, 31 January. The budget is now the number one item on the agenda. In his tireless efforts to convince the world that political problems in post-withdrawal Iraq cannot possibly be attributed to his own tenure as the US ambassador in Baghdad from 2009 to 2010, Christopher Hill today presents a new twist to his narrative. It is hard to know where to begin. For example, did Hill take note of the recent episode in Dhi Qar where a Sunni soldier, Nazhan al-Jibburi, sacrificed his life to stop a terrorist attacking mainly Shiite targets and immediately had streets and new-born Shiite children named for him? Maybe that was not rural enough. Let’s venture further away from the urban distortions of the real Iraq and try to reach the rural purity that Hill doubtless found, unadulterated of course by any possible presence of American security details or other distractions of non-Iraqi origin. Did Ambassador Hill consult some of the best anthropological material on Iraq like the Marsh Dwellers of the Euphrates Delta by SM al-Salim (1962) relating to Chubayish (between Basra and Dhi Qar) or Shaikh and Effendi by R.A. Fernea (1970) relating to Daghara in the mid-Euphrates? There really is not much about sectarian conflict in those volumes. But maybe the 1970s were exceptional. Maybe the 1960s were exceptional too. Perhaps the generally peaceful monarchical period and the late Ottoman eras were exceptional too? If the ambassador is so sure about a “thousand-year head start” for sectarian problems, why doesn’t he at least do us the favour of enumerating some historical empirical examples of bloody sectarian conflict in Iraq, say between 1650 and 1970, to back up his own impressions? Today, Hill is telling us that Iraqiyya is essentially a Sunni party, and as such it should by definition accept a secondary role in Iraqi politics. There are many good reasons for Iraqiyya to reconsider its relationship with Maliki, but the idea of accepting that “Shia majority rule is an immovable fact of life” just isn’t one of them. The examples of Shiites bitterly disagreeing with each others are simply too many for Iraqis to accept this kind of simplistic and essentialist formula for their politics. Do these problems really have nothing to do with the “conflict paradigm” of Iraqi politics that seems to have been a staple of most US ambassadors in Baghdad from Paul Bremer, via Zalmay Khalilzad and Ryan Crocker to Hill himself? Does Hill not realise that some of his own policies actually abetted sectarian tensions – for example when he was apologetic about the de-Baathification excesses of early 2010? One good thing about the latest revelation by Hill is that it may help explain some of his own Delphic policies: Most of the time, Hill was out in the desert, hiking with camels and doing anthropological research, hopefully to be published in a soon-to-come landmark tome! It is exactly one month since the secular, increasingly Sunni-backed Iraqiyya coalition began boycotting the Iraqi parliament, followed by the withdrawal of its ministers from cabinet sessions. It has been a dramatic month full of heated verbal exchanges with political opponents; nonetheless it is high time that Iraqiyya stands back and reflects on what exactly it has achieved so far. In terms of practical results, Iraqiyya’s actions have at least managed to put the subject of some kind of “national conference” on the agenda. Iraqiyya are hoping that such a conference will deal with the fulfilment of promises made by Prime Minister Nuri al-Maliki during the process of government formation in November–December 2010. But doubts remain about the exact agenda, location and date of the conference. More fundamentally speaking, it is the unequivocally negative results of Iraqiyya’s boycott that stand out. The boycott has clearly accelerated a trend of defections from the Iraqiyya coalition by individual politicians and groups of politicians that are more interested in taking part within the system than in boycotting. Examples include prominent politicians from Babel and Nineveh – the latter showing that this is a phenomenon that includes Sunnis as well as Shiites from Iraqiyya. The defectors are not necessarily openly pro-Maliki, but they tend to agree with Maliki on some issues, including an aversion against the recent pro-federal trend among some Sunni politicians. The net effect of all the defections from Iraqiyya since early 2011 may be a loss of around 5 deputies so far. That may not sound like a lot, but every single defection does bring Maliki closer to his dream of a so-called political majority government. So what are Iraqiyya doing at this momentous juncture? Alas, very few new ideas were presented by coalition leader Ayyad Allawi during his speech today. In fact, all three alternative ways forward proposed by Allawi involve constitutional problems that have been debated before. Firstly, the suggestion by Allawi to have new elections under an interim government is unconstitutional. This goes back to an idea which has consumed a ridiculous amount of energy both among Iraqiyya leaders and the Americans since 2009, to the effect that there could be some kind of neutral “caretaker” administration during the run-up to elections. Unless the prime minister resigns or is voted out of office, there is no such thing as a transitional caretaker government in the Iraqi constitution, period. The legal status of the government remains exactly the same until a new government is formed. Additionally, any call for early elections would of course reopen the stalemated debate about the composition of the Iraqi elections commission and the electoral law, probably ensuring that actual elections would not happen until 2013 at the earliest. The second suggestion by Allawi to have the dominant partner in the government, the Shiite National Alliance, change its prime minister (i.e. sack Maliki) is also unconstitutional as long as he means changing the PM only. As per the constitution, once the PM is voted out of office, the cabinet as a whole is considered resigned and it is the job of the president to identify the biggest bloc in parliament and charge its PM candidate with forming a new government. Constitutionally speaking, then, there can be no smooth and easy transition from Maliki to whoever may be waiting in the wings – Allawi is probably thinking of Adel Abd al-Mahdi; Iran of Ibrahim al-Jaafari. Thirdly, the alternative of trying to enforce an implementation of the Arbil agreement itself would also be unconstitutional, as Maliki has rightly reminded us lately. Things like the national council for high policies, the idea of “balance” in the ministries of government, and the re-establishment of the presidency council are all unconstitutional. One of the few specific points of the obscure Arbil “agreement” that actually resonate with the constitution is the demand that bylaws for the cabinet be adopted. In the current political climate, early agreement on such a complex piece of legislation seems entirely unrealistic. The real alternatives for Iraqiyya seem very few at this point in time. They may of course opt for the pro-federal course, as some have attempted, but this might also end up with a bloody nose as well. Examples of Sunni resistance towards federalism continue to manifest themselves, and might well surge considerably if an actual referendum were to be held. A far more realistic course of action would be to forget about most of the acrobatics of the Arbil agreement and instead focus on something very basic: The security ministries that are still run by acting ministers not confirmed by parliament (the interior one being of course Maliki himself). Although the constitution does not expressly deal with the question of acting ministers, the idea of having ministers confirmed by the national assembly is so central to all variants of parliamentary democracy in the world that Maliki would be in for severe international criticism if he should opt to continue with acting ministers indefinitely. What Iraqiyya could and should do is to make a deal with Maliki on the security ministries that appeals to his desire to be in a dominant position vis-à-vis competing Shiite Islamist factions. It is well known that the Sadrists, Fadila and ISCI are all critical of some of Maliki’s nominees for the interior ministry. What Iraqiyya should do is to give Maliki support for an interior minister that is unpopular with the other Shiite factions in exchange for a defence minister acceptable to Iraqiyya. That could, over time, bring about the rapprochement that the Arbil agreement will never be able to produce. For Iraqiyya, the real alternative to rapprochement with Maliki is none of the three options discussed by Allawi today. Rather, it is an inevitable process of internal disintegration, eventually leading Maliki to establish a more narrow governing coalition that will likely exclude many Iraqiyya politicians entirely. Certain comments by Prime Minister Nuri al-Maliki over the past week have failed to receive the attention they deserve. As the political scene in Iraq quietens down for the Shiite Arbain festival and a long weekend, it may be worthwhile to take a closer look at Maliki’s statements regarding disputed territories and the creation of new federal regions that may well reflect his negotiation strategy over coming months. The most sensational aspects of Maliki’s comments are as follows. Firstly, they seem supportive of a plan by President Jalal Talabani, a Kurd, to introduce a bill to parliament that would adjust by law the boundaries of governorates that comprise so-called “disputed territories” and have boundaries that were modified during the Baath. This would be done prior to a final settlement of the disputed-territories issues by referendum. Secondly, in practical terms, Maliki revealed that with respect to Salahaddin governorate, which was created by the Baath in 1976, the plan would involve transferring parts of that governorate with Turkmens and Kurds to Kirkuk and parts with Shiites to Baghdad. Thirdly, Maliki used these arguments against any early referendum for a Salahaddin federal region, indicating that the Talabani plan would have to be implemented prior to any decision on federal status. The Talabani plan, or law proposal, has not been published in its entirety. Nonetheless, there is sufficient information in these comments by Maliki to identify both theoretical and practical problems related to its potential application. On the theoretical level, we know the desire of Talabani and the Kurds more broadly to reverse any administrative changes to governorate boundaries that they interpret as having flowed from racist and anti-Kurdish motives. In particular, Kirkuk’s loss of a solid chunk of territory to Salahaddin in 1976 is seen as something that needs to be rectified. The Kurds appear to believe that the number of Kurds and possibly pro-Kurdish Turkmens in the area will work in their favour as far as aggregate numbers for a reconfigurated Kirkuk governorate are concerned, and also maintain that it would be more difficult to make these changes if Salahaddin was to receive federal status prior to a final territorial settlement. To some extent, chronology works in advance of the Kurdish claims in this regard, because the creation of Salahaddin in 1976 was one of the last major changes to the administrative geography of Baathist Iraq, potentially making it a convenient cut-off point. Other major changes, such as the creation of the Muthanna governorate and the separation of Dahuk from Nineveh both antedated 1971. Clearly, the Kurds do not want to go back to 1971 since they probably see the creation of Dahuk as a virtuous move whose reversal is undesirable (it was in fact part of the peace negotiations between the Kurds and the Baath at the time). But exactly at the same time as the creation of Salahaddin in January 1976, another new Iraqi governorate came into existence: Najaf. This in turn has similarly created cases of “disputed territories” with respect to neighbouring and more well-established governorates like Karbala. Presumably Talabani does not aim to abolish the Najaf governorate. Presumably, too, his law proposal contains impenetrable arguments for abolishing Salahaddin but not Najaf! At the practical level, there are problems too. Why should the Shiite parts of Salahaddin plus Samarra revert to Baghdad but not Sunni Tikrit? 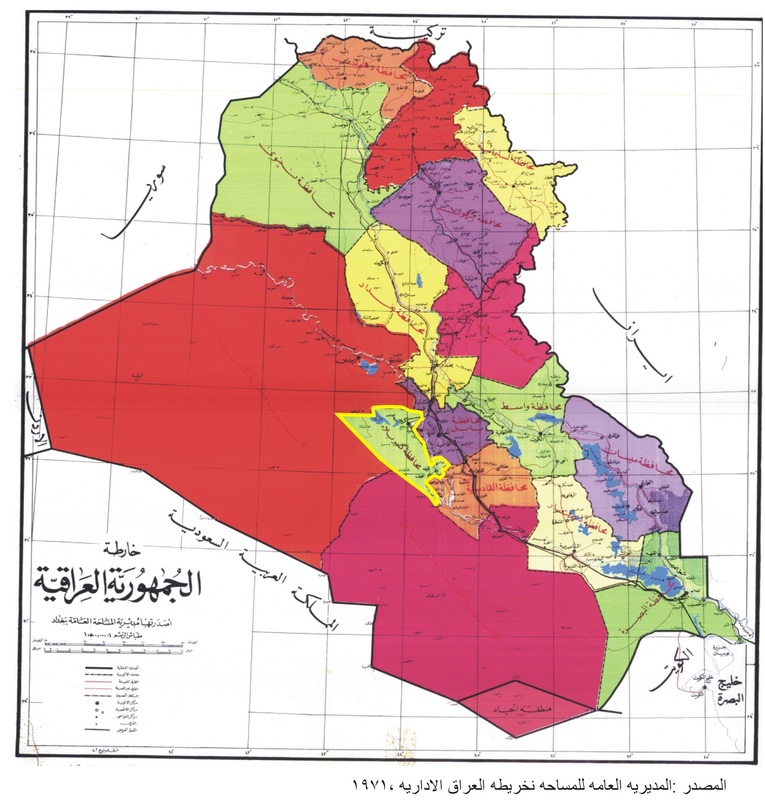 All of these lands belonged to Baghdad in the early 1970s, reflecting administrative realities that date back at least to monarchical times. If the Talabani proposal involves attaching Shiite but not Sunni parts of Salahaddin to Baghdad it will no doubt be seen as sectarian, perhaps in resonance with the idea of a “smaller Iraq” from Basra to Samarra that has been in vogue among some exiled Iraqis. It is interesting that Maliki is flirting publicly with ideas that will be seen by many Iraqis as typically post-2003 partition-oriented discourse – precisely the sort of thing Maliki has tried to steer away from since 2008. On the other hand, we should perhaps not exaggerate the importance attached by Maliki to these ideas as end goals in themselves. Maliki knows perfectly well that whereas giving him the premiership was completed in a single parliamentary session, fulfilling all his promises to the Kurds and others depends on further legislation in parliament. Each legislative initiative comes with at least three crucial junctures (first and second reading before a vote), each of which offers opportunities for unexpected drama that can easily consign a legislative project to the growing catalogue of on-hold items awaiting political consensus. This may well be Maliki’s real intention in flirting with the Talabani initiative on disputed territories. The Kurds will see it as a concession of sorts. Sectarian Shiites will like the idea of a bigger Baghdad extending to Samarra. None of it is likely to come into existence anytime soon. In the clearest statement yet, Kurdish leader Masud Barzani has said he will not attend any national conference to deal with the current political crisis if it is held in the Iraqi capital, Baghdad. Barzani’s stance is supported by Ayad Allawi, the leader of the secular and increasingly Sunni-supported Iraqiyya party, and is strongly resisted by the Iraqi premier, the Shiite Islamist Nuri al-Maliki. The question is whether the move will prove a bridge too far for Barzani. Or rather, the real question is whether Maliki truly needs the national conference, tentatively scheduled for the end of January. Maliki has after all spent the weeks subsequent to the US withdrawal in mid-December to signal a complete disregard for the issues that his detractors (and partners in government) want to discuss at the national conference. Above all, Maliki has gone far in saying that the Arbil agreement of November 2010 is mostly unconstitutional (which is true), and that having received his share of the bargain (the premiership) he intends to ignore anything in the agreement that cannot be found in the constitution. This includes calls for the creation of a high council for strategic policies, ethno-sectarian balances in government ministries and ethno-sectarian formulas for the allocation of security ministries. To some extent, developments over the last weeks have indicated that Maliki may in fact succeed with an audacious policy of ignoring both Iraqiyya and the Kurds at the same time. In the first place, despite the Iraqiyya boycott, parliament has continued to meet and has made some progress on the 2012 budget which needs to be passed over the next month or so. Iraqiyya has seen a flurry of defections, quite a few of which have occurred in Sunni-majority areas and cannot easily be attributed to intimidation by Maliki supporters (as has been claimed with respect to the south). Some Iraqiyya ministers – in particular independents and those from smaller factions like Al-Hall – have continued to take part in cabinet despite an official boycott. When Maliki presides over elaborate military displays and emphasises his role as commander in chief, he is probably thinking of an alliance of his own Shiite coalition and new breakaway elements from Iraqiyya and the White party that alone can reach the critical absolute-majority mark of 163 deputies in parliament. Recent reports suggest Maliki is even about to try to reshuffle the Kurdish chief of the Iraqi army. It is not the first time such rumours appear: In December they were heard in relation to Kurdish demands for more power in government; this time it is being suggested the refusal to hand over Vice President Tareq al-Hashemi is part of the equation. It is high time Iraqi politicians begin to understand Maliki and his modus operandi. In 2010 he promised the Kurds to deliver on their 19 points in exchange for their support for his second term – and went on to discover that most of those points were unconstitutional so it would be difficult to implement them. There is a similar situation with the Sunni-majority governorate of Anbar, which handed Maliki a list of 20 points. Maliki approved, of course, provided that everything was in accordance with the constitution. Needless to say, from 2008 and onwards the federal supreme court has mostly produced rulings in favour of Maliki – certainly on questions of centre-governorate relations where some decisions have placed the provincial powers law of 2008 above the constitution itself. The judiciary also seems sufficiently amenable to Maliki’s desires that it synchronises its business to fit his agenda, probably creating a sense of terror among political opponents not unlike that seen during the run-up and the immediate aftermath of the March 2010 parliamentary elections. But Maliki can also be pragmatic. He probably does not care much if the Iraqi parliament is left to its own devices for most of the year, but he does need its approval for the annual budget. Exactly one year ago we had a similar situation subsequent to the euphoria of the government formation; Maliki then turned to the Kurds and made compromises on oil exports the basis for a budgetary deal. He went on to ignore most of the Arbil agreement and has continued to consolidate power. Today he is probably weighing whether he actually needs the Kurds – all of the Kurds – to pass the 2012 budget. Scenes like these have been played out before. It deserves mention that much of the Arbil conference that led to the formation of the second Maliki government actually took place in Baghdad. The Iraqi football association – just like Iraqiyya dominated by secular and anti-Maliki personalities – long tried to have its summit in Kurdistan but eventually ended up having it in Baghdad anyway. Maliki must be asking himself why he, as the Iraqi prime minister, should take the trouble of travelling to the Kurdish region to attend a conference he does not really need. Maybe the most interesting question today is whether the rest of the Kurds, and in particular those who are the Kurdish competitors of Barzani, will back up his demand to have the conference outside Baghdad. The Iraqi national assembly was it usual self today, with the predictable assortment of idiosyncrasies that are typical of Iraqi politics. However, for Prime Minister Nuri al-Maliki, there was some good news. This includes the simple fact that the parliamentary sessions continue to take place despite the boycott by the secular Iraqiyya party. Today, once more, signs of tensions between Maliki’s own Shiite Islamist State of Law bloc and the Kurds at one point threatened the quorum of the session, but an amicable resolution was found and the session could resume, technically as an “extraordinary session” since it had been officially terminated during the preceding tension. With relative peace vis-à-vis the Kurds, Maliki is probably satisfied with the fact that some Iraqiyya members opted to take part in the session, which altogether counted 192 members, thus comfortably above the quorum threshold at 163 and not that much different from the normal attendance level in 2011. Reportedly, those Iraqiyya members present numbered between six and eight. Over and above that, they included at least three deputies who say they are forming a new bloc within Iraqiyya, opposed to calls for Sunni-area federalism and sympathetic to Shiites that have defected from Iraqiyya in the south. These three deputies all nominally belonged to the Iraqiyyun bloc of parliament speaker Usama al-Nujayfi in the past, and one of them was formerly a prominent advocate of a majority government between Iraqiyya and State of Law. Conceptually, then, this new tendency seems similar to the White Iraqiyya breakaway faction of Iraqiyya which is reckoned as openly pro-Maliki. (Equally important is the fact that they remain separate and have not joined White Iraqiyya.) Additional Iraqiyya attendants in parliament today reportedly included members of the Hall (Karbuli) faction. It is noteworthy that the assembly today managed to agree on additional judges to the de-Baathification appellate court, which had proved troublesome in the past. In the past, White Iraqiyya has sometimes been dismissed as “Shiite Iraqiyya”, which is not entirely plausible since it also includes vocal Sunni members from Nineveh. Today’s developments stress that there are more Sunnis in the north that are prepared to speak the language of anti-federalism and could be potential allies to Maliki in the north. They come at a time when there are conflicting reports about the exact status of Iraqiyya ministers boycotting cabinet meetings, with some reports suggesting that certain individual ministers are prepared to return. Again, the Hall faction is mentioned as a possible dissenter to the general Iraqiyya line. To Maliki, this is the ideal scenario: Parliament continues to function, not terribly effective, but enough to get some things done and preventing a formal disintegration of democratic politics. Maliki may well be hoping that similar things could happen at the level of the cabinet , since a situation with too many acting ministers unapproved by parliament in the long run would threaten one of the most basic principles in a parliamentary democracy – that of ministerial answerability to the national assembly. It is noteworthy that all these developments point in a different direction than the doom and gloom associated with the Iraqiyya boycott and renewed violence today. Importantly, and often overlooked by Western policy-makers, this is a potential avenue of rapprochement that has nothing to do at all with the Arbil agreement. As Iraqi parliamentarians reconvened for their first session of 2012 today, the full spectrum of ongoing political crises were on display. Symptomatically, the basic facts of who attended and who did not at times took precedence over the substantial content of the session. In the first place, the secular and increasingly Sunni-backed Iraqiyya party remained absent. A comfortable quorum was nonetheless reached with around 180 deputies present from the Shiite Islamists, the secular White Iraqiyya breakaway faction from Iraqiyya, and the Kurds. That did not last long, however. Protesting against statements by Hussein al-Asadi, an ally of Prime Minister Nuri al-Maliki, the Kurds withdrew from the session, demanding an apology from Asadi. Asadi had accused the Iraqi president, Jalal Talabani, a Kurd, of illegally providing shelter for the newly indicted Tareq al-Hashemi, the Sunni vice-president, thereby supposedly violating the anti-terrorism law. Other members of the Shiite Islamist parties including Maliki’s own State of Law alliance intervened and provided assurances that Asadi would not attend parliament until he had recanted. The Kurds promptly returned to the session. These developments show two things. Firstly, the Kurds remain committed to the parliamentary process despite the boycott by Iraqiyya. Symptomatically, they did not achieve an outright condemnation of Asadi, but rather a document containing several clauses that would address the matter through parliamentary procedure. Secondly, there are forces in the Maliki alliance – such as Asadi – that still dream of dominating parliament through a wafer thin alliance with White Iraqiyya, ignoring the Kurds. This trend – which failed to prevail today – should not be underestimated. Already, lawyers in Shiite-majority governorates like Diwaniyya are threatening to sue Talabani for failing to surrender Hashemi. In another sign of Maliki’s inability to proceed with a bolder course in parliament, no vote of no confidence in vice premier Salih al-Mutlak, also of the Iraqiyya party, was held. The true test, however, will come later in the month with an expected national conference to deal with the latest political unrest. It is noteworthy that Maliki has used the past few weeks to speak out vocally against several power-sharing clauses of the shadowy Arbil framework that led to the creation of his second government in December 2010. This continued a trend seen throughout 2011, when Maliki increasingly sought to evade any discussion of the exact contents of that agreement. Whether the Kurds attending the national conference will be satisfied with a verbal fudge of the kind seen in the Talabani-Asadi altercation today remains to be seen.